The Five Forces Model is an analytical framework first developed and advocated in 1980 by Harvard professor Michael Porter and further extended by other scholars and industry practitioners. Note that the Five Forces Model is specifically a framework for external situational analysis that draws upon industrial organizational economics because it serves as a tool for analyzing the structure of firms and markets. It is specifically designed to understand and examine the nature of five forces that govern competition. These are: (1) the intensity of rivalry among competitors; (2) the threat of potential entry; (3) the bargaining power of suppliers; (4) the bargaining power of buyers; and (5) the threat of substitution. The key advantage of using the Five Forces Model is ease of use. Using this model does not require technical skills or special training. Essentially, any individual or a team with the right amount of knowledge or an extensive familiarity over an industry and strong research skills can easily use this analytical tool. Another advantage of the model is it is more specific compared to SWOT and PEST. This advantage centers on the fact that this model provides a framework for determining the level of competition in a particular industry or market and how external forces affect the performance of the firm. Compatibility with other analytical tools is another advantage of the Five Forces Model. As a framework for external situational analysis, it can be used to further substantiate a SWOT or PEST analysis. It can also be used with the VRIO framework, especially when it comes to determining the resources and capabilities of industry rivals or new entrants. However, despite providing a framework for market-specific and industry-centered external situational analysis, the Five Forces Model has problems or criticisms and disadvantages nonetheless. One critical disadvantage of the Five Forces Model is that it only serves as a starting point for more detailed analysis of firm performance. To be specific, the model provides a checklist of external forces that can be beneficial or detrimental to a firm. Another problem with the model is that it is generally geared toward a qualitative evaluation of the strategic position of a firm. This model does not provide a mechanism for quantifying how each force and its factors affect firm performance. It does not also have a mechanism for determining which of the factors within each force have more weight. The lack of quantifying mechanism or the inclination toward qualitative evaluation can create ambiguity or foster subjectivity. Inexperienced individuals can have the tendency to rely on questionable data such as personal anecdotes and hearsays, as well as general descriptions or statements to substantiate and describe external forces. Personal and cognitive bias might also limit the information generated using the Five Forces Model. Due to a particular bias, some individuals might be limited to identifying those factors within each force that are either favorable or unfavorable. Incompatibility with diversified firms is another disadvantage of the Five Forces Model. Essentially, this model cannot be used to analyze the external situation of an organization with diversified products and service offering or in other words, of a firm with business interest across different industries or markets. The same incompatibility is also demonstrated whenever the model is applied in a firm operating in a complex industry with multiple industrial and market interrelations. Thus, this model is best applied in simple market structures. Critics have also identified other shortcomings of the model. For example, the model disregards the interaction and possibility of collusion among buyers, competitors, and suppliers—and how this interaction and possible collusion can affect firm performance. Because the model is based on the idea of competition, particularly how a firm competes over similar firms as well as customers and suppliers, it disregards strategies such as strategic alliances. Another criticism of the Five Forces Model is that it does not help a firm to identify sources of sustainable advantage. The model merely lists down the factors that are either favorable or unfavorable to firm performance but it does not have any mechanism for determining which factors give a firm sustainable competitive advantage over its competitors. In comparison to SWOT Analysis and even the VRIO Framework, another problem with the model is that it seems a useless tool for analyzing the situation of non-profit organizations and government institutions. It simply works best for profit-oriented organizations. Disregarding dynamic competition is another criticism of the Five Forces Model. For example, forces such as barriers to entry and threats of substitute are generally assumed as static. The model fails to consider that competition is actually dynamic. Globalization has also demonstrated that certain firms have continuously neutralized or destroyed the competitive advantage of other firms through innovation. Conclusion: What is the problem with the Five Forces Model? 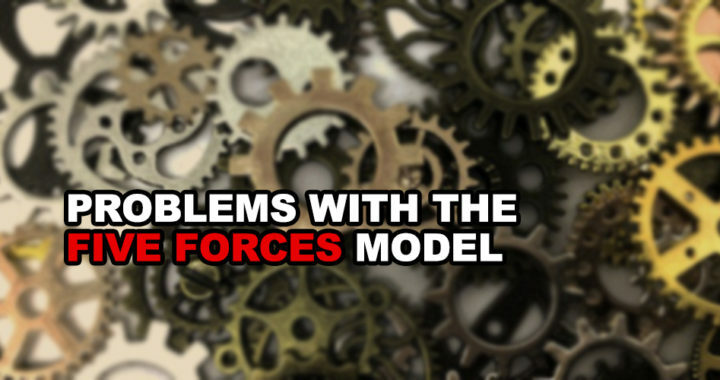 The problems with or criticism of the Five Forces Model centers primarily on its inability to take into new account complex situations and requirements. As mentioned, it merely generates a list of factors without a way of explaining further how each affects firm performance. In addition, the model is best applicable for analysis of firms operating in simple industry and market structures because it disregards new business models and the dynamics of competition and interrelation. However, the Five Forces Model remains a valuable tool for external situational analysis. It simplicity and ease of use makes it a generic tool used as a starting point for further analysis.